With the clever birthday poems here, make the super-smart birthday girls and boys in your life feel incredibly special...and satisfy their hunger for brain teasers. Striking the perfect balance between cleverness and sentimentality is the right route to take for a birthday message, even more so when that birthday message is poetic verse. 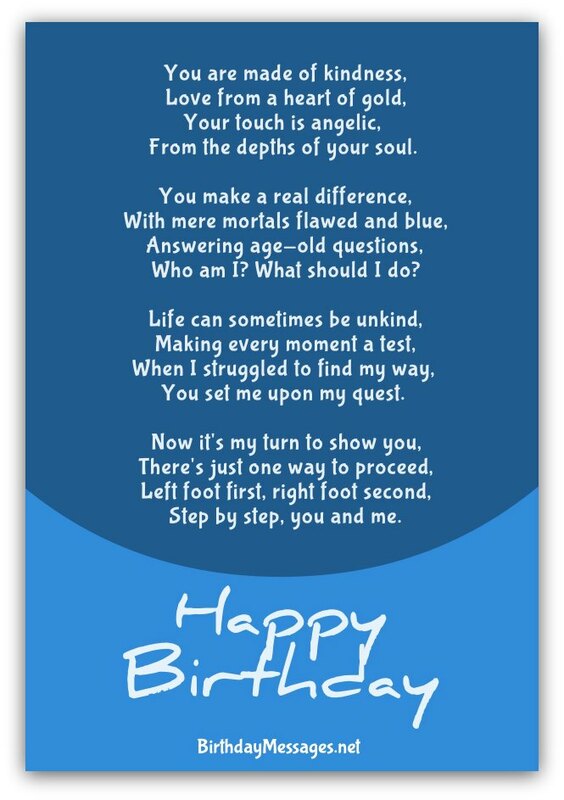 For the birthday boy or girl, a birthday poem with a smart, heartwarming message can make a real difference in his/her life and, at the same time, make your loved one feel really special. Need a little help choosing the right clever poems for your loved ones? You're just a click away from a bunch of helpful hints. 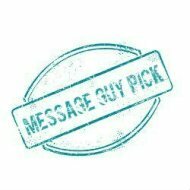 Click here to read Message Guy Tip #97 and find the perfect poem to send. From the depths of your soul. You set me upon my quest. Step by step, you and me. I love this poem. Looking Back offers a true definition of success for young and old, even though poet Edgar A. 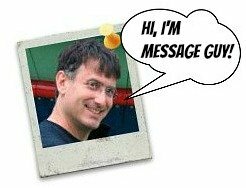 Guest writes as a man or woman close to death. The definition? Don't regret anything if you've lived a life full of love for nature, family and friends (not only if you've accumulated piles of gold and silver). If you know anyone who is despondent over their lack of material wealth, share this poem with them, especially on their birthday (when they might be ripe for a change in perspective). And you may want to add the following birthday wish to this poem: "Here’s to a rich life full of love. Happy birthday! For the money I might have made. If I could live my life over again. Tho' some say I've wasted my years. For the gold I might have possessed. And eased the pain I hid. By much more than mere wealth. That beat in tune every day. Forever and to the end. This is a poem that cleverly transforms scenes from nature into a allegory about change — specifically, knowing when it's time for a new beginning, even when following your heart can be a treacherous journey, fraught with the unknown, dark days and winter chills. New Beginnings is perfect for anybody who needs an extra shove in the right direction, a direction that leads, in the words of poet Gertrude B. McClain, to "a new beginning for each heart, as fresh as morning dew." Sounds delightful! That's what puts this wonderfully clever poem into the big leagues (in this case, the league of clever birthday poems). 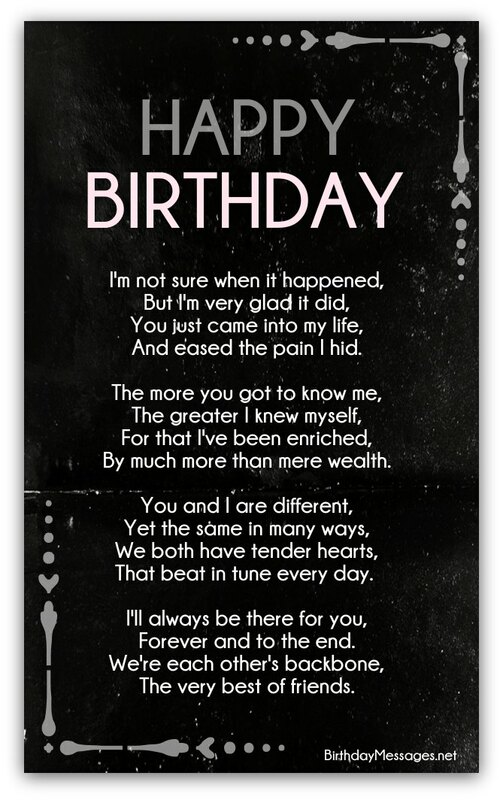 If you would like to add a birthday wish to this poem, try this one: "Happy birthday! Here's to a new start. May all that your heart desires be yours." My wings under skies of blue. Now my path is as it should be. When clever birthday poems have a title like Life doesn't frighten me at all, you figure that the poet behind this verse has their tongue planted firmly in their cheek or is trying to cleverly make a point. When the poet is Maya Angelou, you can count on both. That's essentially why I chose this verse as one of the top clever birthday poems in this section. What makes Life Doesn't Frighten Me at All a clever, tongue-in-cheek poem is the same reason why it's one of my top picks for my Clever Birthday Poems section: its ingenious way of showing children (and the inner child in each of us) that believing in ourselves is the best way to ward off the fearsome, paralyzing images we summon in the dark (literally and figuratively). Angelou herself once stated (in her book, Life Doesn't Frighten Me) that she wrote "for all children who whistle in the dark and who refuse to admit that they're frightened out of their wits." Indeed, Life Doesn't Frighten Me at All, like most clever birthday poems, takes on a tricky topic (like the defiance of fear) with such dignity, grace and cleverness that it's impossible not to be charmed by it, whether you're an adult, teenager or child. What a wonderful poem to send anyone, any age, who lets fear get in the way of living. 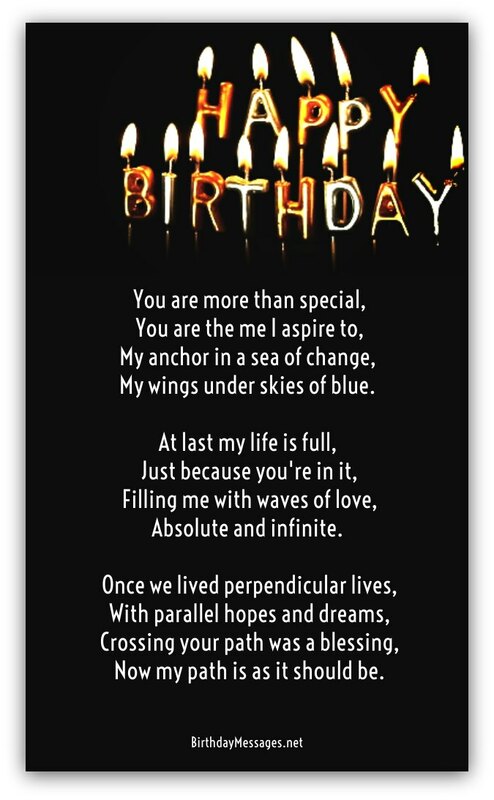 Want to add a nice birthday wish to this poem? Here's one to consider: "Happy birthday! I will be your magic charm that you keep up your sleeve...in case you see any dragons breathing flames." They're the finest on earth. If we just took it to their door. And share their joy today.